Last Sunday we went for a picnic and walk around the Warburg Nature Reserve just north of Henley-on-Thames. It's run by the Berkshire Buckinghamshire Oxfordshire Wildlife Trust. Very nice place and well organised with a visitor's center, well marked paths and bird watching blinds. 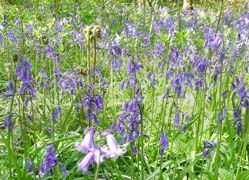 We got a chance to catch the last of the bluebells that carpet England this time of year. I just wanted to hear about The Warburg Nature Reserve?